other information International Traditional Music Society ITMS0401, 2004. 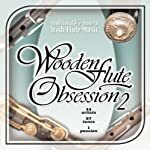 Subtitle "Traditional and Modern Irish Flute Music." 2-disc compilation of 44 flutists. I dated each track according to the additional notes from the publisher at <http://worldtrad.org/WFO2_CD2.htm>. Not indexed here: track 11 of disc 2 (What Would You Like? / Untitled / Untitled) and track 17 of disc 2 (Da Sixereen, The Plagiarist / Buntata's Sgadan).